According to holiday lore, poor Rudolph was a victim of social exclusion because he was different from the rest of the reindeer. In a move that was lucky for nice children everywhere, he was then approached by Santa, who asked him to guide the sleigh. Thereafter, according to traditional sources, all the reindeer loved him. While cross-country skiing has been a human pastime in Norway and elsewhere for centuries, the activity has seen a recent increase in the last fifty years, owing to the continued construction of mountain cabins and ski lodges, and improved access to alpine areas due to the development of road and trail systems. With the increase in skiing also comes an increase in other snow activities, such as snowmobiling. In 2002, for example, there were 49,260 snowmobiles in operation in Norway. This could be problematic for the 30,000 to 40,000 reindeer inhabiting the twenty-six defined "management areas" in Norway. During the harsh winter, reindeer typically reduce their activity and rely on a combination of stored fat and limited, nutrient-poor foods such as lichens in order to survive. The increasing human presence in reindeer habitats, therefore, could force the reindeer to use more energy than is optimal as they attempt to avoid human interaction. This could also reduce the time that reindeer can spend grazing. Taken together, human encroachment could have the compound effect of reducing the body weight of reindeer, and for females, their conception rate and age of first reproduction. In an effort to understand how increasing tourism in remote parts of Norway could affect wild reindeer populations, researchers from the University of Norway compared the behavioral responses of reindeer (Rangifer tarandus tarandus) to humans on skis and to snowmobiles, in Setesdal-Ryfylke, in southern Norway. Since the 1990s, the winter population in the study area has been stable at about 3000 reindeer, with approximately 800 calves born each year. On average, this comes out to one reindeer for every two square kilometers. Part of the reason for choosing this study area was the lack of large predators – this helps to ensure that reindeer responses to approaching skiers or snowmobiles aren't affected by other nearby threats. In order to collect their data, an observer approached a reindeer herd at a constant speed (4 km/hr for skiers, and 20 km/her for snowmobiles) until they had reached the original location of the herd. For each incident, they recorded nine variables: the provocation method (ski or snowmobile), weather (sunny, cloudy, raining, snowing, foggy), wind speed, topography (level or hilly), activity of the reindeer prior to provocation (lying, foraging, moving, or a combination), herd size, herd composition, wind direction (relative to the reindeer), and the original position of the observer (relative to the reindeer). They also recorded the reindeers' response to the human intrusion. In order to collect enough data, they repeated this each winter for three years. The results were straightforward. Compared to disturbances by skiers, reindeer became aware of snowmobiles at longer distances. However, their physical displacement was shorter for snowmobiles than for skiers. The researchers conclude that "reindeer were more easily disturbed by snowmobiles, but reacted stronger when provoked by skiers." They were more easily spooked when approached from downhill than from uphill, and their escape distance - that is, how far they ran - was longer when they were approached while lying than while grazing. It's possible that the reindeer were able to notice the snowmobiles sooner due to the noise from their motors or the flashing from the headlights. Even still, skiers seem to disturb them more than snowmobiles, which is perhaps surprising. The researchers hypothesize that this could be due to confusing skiers for hunters. They write, "hunting is not allowed from motorized vehicles in Norway, and chasing and harassing wildlife is strictly forbidden. However, reindeer are hunted by humans on foot and probably do not discriminate between a hunter and a tourist." What does all this mean for regulating the tourism industry in places such as Norway with wild reindeer? Wild reindeer in Norwegian mountains don't generally have more than three human encounters per day during the busiest tourist seasons. 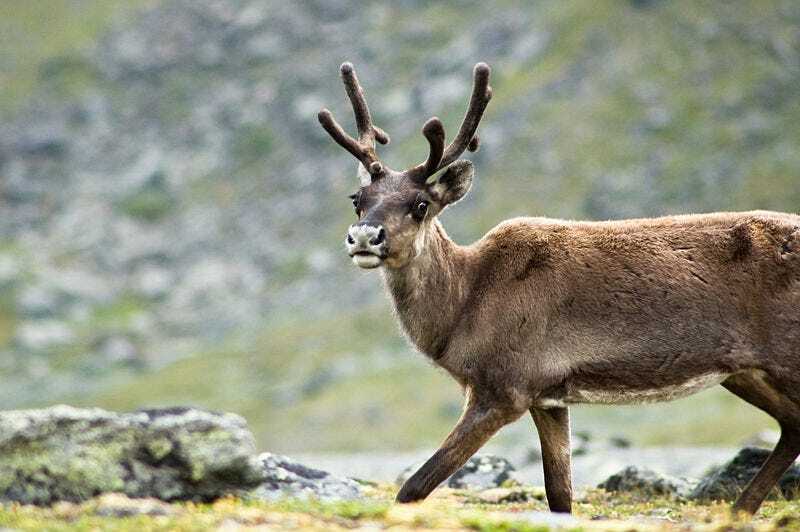 By combining this with the data from their experiment, the researchers calculated that reindeer would add approximately 3.4% to their daily energy expenditure for three skier encounters, and 2.3% more for three snowmobile encounters. They note that this extra energy expenditure should be easily compensated for, as long as these encounters are limited to the 2-4 week-long tourist season. This is good news, though the work is far from over: it is still possible that loss of access to optimal habitats due to avoidance of areas frequented by humans, combined with subsequent overgrazing of undisturbed habitats could still have negative implications for the health of reindeer herds. The other caveat is that these numbers hold only as long as snow levels remain constant. This is because deeper snow makes moving through it more effortful, meaning that more energy would be expended by reindeer in flight from approaching humans. It is not clear how climate change could enter into this process: it is possible that increased snowfall due to climate change could make it impossible for reindeer to compensate for even three encounters per day with humans. This post was modified from one that originally appeared at Scientific American on December 25, 2011. Jason G. Goldman is host of The Wild Life podcast. Follow on Facebook or on Twitter: @jgold85.